Over the past 30 years, superconducting Josephson junctions have become one of the major topics of research in low temperature physics. The Josephson community is wide and varied, spanning areas as fundamental as quantum measurement and coherence and as applied as ultra-sensitive detectors and voltage standards. Our research uses junctions as model systems for problems in nonlinear dynamics. 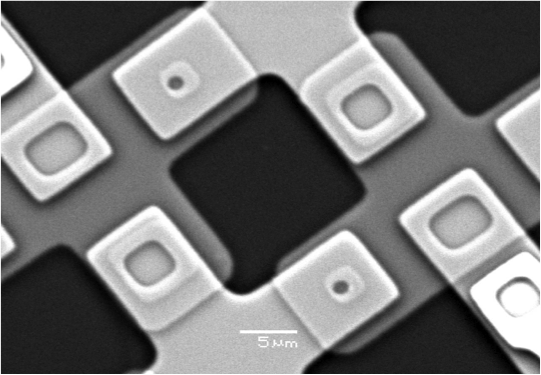 At its heart, a single Josephson junction is simply two superconducting electrodes separated by a thin insulating tunnel barrier. For every junction, there exists a degree of freedom, the so-called phase difference, which turns out to completely describe the junction’s electrical behavior (knowing the dynamics of the phases one can predict all measurable properties). When writing the equations for a junction biased by an external current we find a nonlinear equation for the phase which is equivalent to the equation for a nonlinear pendulum or a particle moving in a washboard potential, two paradigms of nonlinear science. Connecting multiple junctions together and forcing them to share current causes phases from different junctions to be coupled together. If there are N junctions in a circuit, that circuit’s behavior represents the dynamics of N coupled nonlinear differential equations. In general, our research focuses on the use of Josephson junctions connected in various networks to address topics in nonlinear and complex phenomena. For years, our group has worked on the theoretical study of circuits based on superconducting Josephson junctions in close collaboration with various experimental groups (Professor Orlando at MIT and professor Segall at Colgate University, both in the USA). Our work will have extensions to many different areas of study. First, it will contribute to the general area of the deterministic and stochastic dynamics of nonlinear excitations in extended systems. Second, by moving toward quantum ratchets and rectification of quantum fluctuations, the experiments can connect with much of the work being done in quantum computation and open quantum systems. Finally, this work will be important for the Josephson community in general and the use of Josephson arrays to model nonlinear systems. conCiencias.digital 9, mayo 2012, 16-25. Física y Aplicaciones del efecto Josephson. En “Ciencia y Tecnología en el siglo XXI”, pp. 207-210. Tibidabo Ediciones S.A. (Barcelona, Spain, 2001). Localización intrínseca y redes superconductoras. L.M. Floría, J.L. Marín y J.J. Mazo. Investigación y Ciencia, Junio de 2002. J. J. Mazo, in “Energy Localisation and Transfer”, pp.193-246. Ed. T. Dauxois, A. Litvak-Hinenzon, R.S. MacKay and A. Spanoudaki. Advanced Series in Nonlinear Dynamics, Vol 22. World Scientific (2004). Thermal depinning of fluxons in discrete Josephson rings. Subgap biasing of superconducting tunnel junctions without a magnetic field. 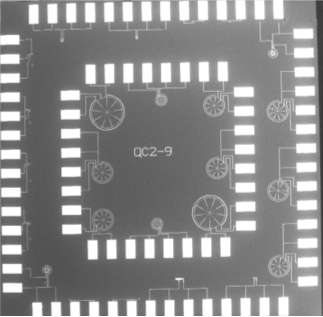 Numerical simulation of multi-junction bias circuits for superconducting detectors. Multiple junction biasing of superconducting tunnel junction detectors. Applied Physics Letters 86, 153507-1(3) (2005). Discrete breathers in Josephson arrays. Phys. Rev. Lett. 89, 234101 (2002). Fluxon ratchet potentials in superconducting circuits. Applied Physics A 75, 263-269 (2002). Interactions between Josephson vortices and breathers. Discrete breathers in Josephson ladders. Physica D 156, 98-138 (2001). Discrete breathers in nonlinear lattices: Experimental detection in a Josephson array. E. Trías, J.J. Mazo and T.P. Orlando. Physical Review B 60, 15398 15413 (1999). Discrete breathers in dc-biased Josephson-junction arrays. Physics Review B 59, 13604 7 (1999). Intrinsically localized chaos in discrete nonlinear extended systems. Europhysics Letters 45, 444 9 (1999). Europhysics Letters 45, 700 6 (1999). Floquet stability of discrete breathers in anisotropic Josephson-junction ladders. Physica D 119, 175 83 (1998). Josephson-junction ladder: A benchmark for nonlinear concepts. Physica D 113, 387 96 (1998). Equilibrium properties of a Josephson junction ladder with screening effects. Phys. Rev. B 54, 16068-16076 (1996). Josephson junction ladders: ground state and relaxation phenomena. J.J. Mazo, F. Falo y L.M. Floría. Phys. Rev. B 52, 10433-10440 (1995).